Kim Soon Lee was established in 1968 by Mr Lim Chai Kiui, who still oversees the running of the company as the Managing Director. It first started as a lorry transport company with a 1.5 ton truck transporting general food and industrial materials. As business picked up, the company gradually turned towards transporting chemical products, helped in large part by Mr Lim’s previous work experiences in a chemical production firm. 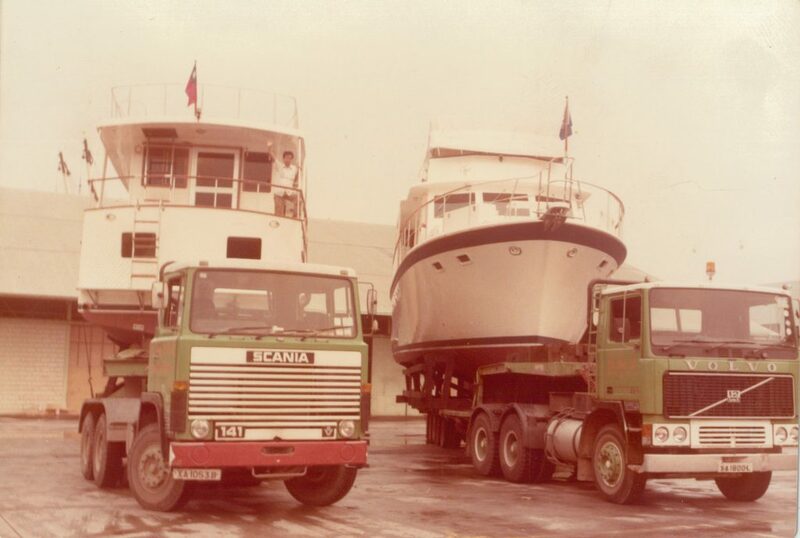 By the mid 1970s, the company had expanded to possess 5 lorries and was among the top chemical transportation companies in Singapore. The outbreak of the Oil crisis in the late 1970s, coupled with changes to the rulings of chemical transportation then dealt a heavy blow to Kim Soon Lee’s fortunes. Seeing a dramatic drop in the demand for its mainstay business, Mr Lim turned to try his luck in the heavy equipment transportation market, something he had never done before. With great determination to succeed and assisted by the boom in the construction market then, Mr Lim not only turned the tide against him but managed to build up a credible vehicular fleet. By the late 1980s, Kim Soon Lee had possessed a fleet of 12 prime movers, 25 trailers and 8 lorry cranes and became a respected name in Singapore’s transportation market, particularly in the transportation of bulky and out-of-gauge cargoes. The 1990s witnessed early years of incredible economic growth and subsequent economic recession for Singapore. Starting from 1997, Singapore experienced years of economic stagnation. The heavy equipment transportation market was very badly hit and many transport companies went bust. Unwilling to be subjected to the same fate, Mr Lim went about re-strategizing the company’s direction. He observed that while the construction market, to which Kim Soon Lee’s business was so heavily reliant on, was down, there was an upsurge in demand for Sensitive equipment handling as well as One-Stop Logistics services. Thus from the late 1990s, Mr Lim went about building a Logistics wings for Kim Soon Lee. From a pure transport company, Kim Soon Lee diversified to providing machinery packing, crating, moving and warehousing services. While the above diversification took place, efforts to expand its transportation wing did not halt. The years from 2001 till 2015 saw Kim Soon Lee’s vehicular fleet comprising of prime movers, trailers, lorries, lorry cranes etc increase from 90 to 420. Staff number also increased from 40 to 280 during this period. Mr Lim reasoned that to be a truely “One Stop” service provider, possession of its own vehicles and hardwares, though costly, is a must. This will enable the company to control its quality of service, which is what differentiated Kim Soon Lee from its numerous competitors. In line with this thought, the company invested a total of S$8 million in 2012 to set up a Mobile Crane division, closing the last gap in its heavy lifting and transportation business. Currently, Kim Soon Lee owns a total of 9 Mobile cranes ranging from 70 to 200 tons, all brand new models imported from Germany. In the same year too, Kim Soon Lee started a forklift rental department, leasing out Japanese made forklifts from 3 to 24 tons to its wide range of customers. To support the increase in number of equipment and vehicles, Kim Soon Lee purchased two yards; namely the 4 acre Bedok yard and the 2.5 acre Toh Tuck yard in 2005 and 2008 respectively. And in response to the greater demand for storage facilities, Kim Soon Lee in late 2015, purchased a 200,000 square feet warehouse on a 8 acres property in Tuas West. This purchase is expected to fulfil the storage requirements of Kim Soon Lee in the next few years. Currently, Kim Soon Lee is well entrenched in its position as a leading “ONE STOP Transportation & Moving Specialist” company in Singapore, providing a wide array of cargo handling and transportation services. From the construction to the oil and gas industry, from freight forwarding to house hold moving, Kim Soon Lee’s involvement in various sectors of the country’s economy is self-evident. With a young second generation management team strongly in place and with the company still growing, indeed, Kim Soon Lee is poised to achieve greater heights in the coming years.